Most people know Bill McDermott as the CEO of SAP, a member of the 1%, earning $US9.6 million in 2013. But he didn’t start out that way. He was born to a working family in Long Island, full of love, setbacks, and heartbreak. 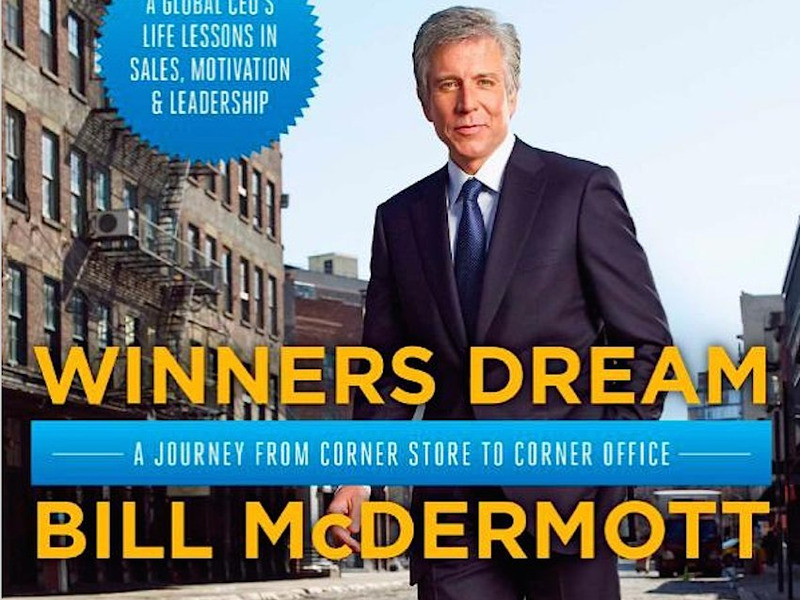 McDermott has poured out his whole amazing life story in a new book, “Winners Dream.” The book is part memoir and part business strategy. He hopes his story will not just inspire other hard-working youths, but show them how to do the same. growing up in a home so rickety that the floors flooded every time it rained. Still, his parents loved it until it burned to the ground when McDermott was a child. the death of his 5-year-old baby brother when McDermott was 7.
a street fight at age 11 that ended when McDermott stuck a pencil in the boy’s cheek. At 16, buying the neighbourhood deli by borrowing all the money. He talked the owner and suppliers into revenue-sharing agreements. The deli put him through college. getting his big break for a sales job at Xerox by convincing the manager to hire him that same day. To this day McDermott pays it forward by giving others their big breaks, he says. getting another big break in the form of a “promotion” that meant a pay cut, moving his family to the worst performing district, Puerto Rico, a location so marginally unsafe, McDermott landed in the emergency room from sand fleas. He turned it into the best-performing district (and learned to stop scratching). supporting his wife through breast cancer. Cancer would later claim the life of his mother. Throughout all this, the essence of McDermott’s story is: Work hard. Treat all the people in your life with love and respect. Keep a positive attitude no matter what life throws at you. Business Insider: You wrote with touching openness about your wife, Julie’s, breast cancer, about juggling a home life with two boys and a new job while your wife was in treatment. Can you describe that period in your life? 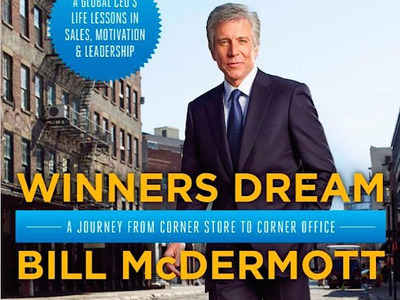 Bill McDermott: Shortly after leaving [my secure job] at Xerox, we found out that Julie had cancer. We had the big house on hill in Connecticut. We were brand new to the neighbourhood. I had a brand-new global job at Gartner and my wife was sick with cancer. She had six months of chemo. But my job to still to go be global president of Gartner. I was blessed with a brave wife. Julie probably did more than any other wife under the circumstances. My mum and dad were on Long Island, so if I was on the road, my mum would stay. BI: Years later, your mum died of cancer, too. How did that affect you? BM: It affects everything, in the sense of my having empathy for other people. I also launched the Kathleen McDermott Foundation for pancreatic cancer. Pancreatic cancer is one of those cancers that doesn’t get much attention unlike breast cancer, where they have made major strides. A lot of people take it for granted that a pancreatic cancer is a one-way trip out of this world. We’re doing more research that could significantly [help find treatments]. BI: You came from a working-class family and now you are a member of the 1%. What do you think about income inequality debate that says the deck is stacked against the poor? BM: The main thing is everybody deserves an opportunity. I knew the day I went on [that job interview] at Xerox, I was fighting for my life. Let’s say I didn’t get the job at Xerox, my life would have been different. Maybe I would not have wound up in the 1%. But I would have worked my way to something. I wouldn’t have left my life’s journey to chance. I out hustled. You got to put yourself in a position to succeed. If you don’t get your first break, you’ve got to try again. And even if I wasn’t part of the 1% now, I would have found honour in my work. BI: You work for an internationally renowned billionaire, Hasso Plattner, who is as known for his philanthropy fighting HIV/AIDS as he is for cofounding SAP. How has that influenced you? I learned that you can be a billionaire and an extremely humble man. His mind is not complicated with a lot things that don’t matter. People can have a lot of success and also be the same person after they have all the success.